What the world needs right now is love, sweet love. 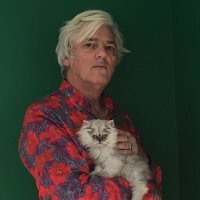 Or instead, maybe "Love From London", the most-recent and rather glorious long-player from one of the UK's most imaginative songwriters and performers, Robyn Hitchcock. Much has happened since Hitchcock first arrived on the scene in the '70s with his critically-acclaimed (but often misunderstood) outfit The Soft Boys. Various economical rises and falls, riots, the break-up of The Soft Boys and the beginning of a long and fruitful, if not hugely commercial, solo career that has resulted in bright cerebral pop music recorded with the help of members from his own Venus 3 and Egyptians, plus R.E.M., Ministry (no, really), XTC and most recently KT Tunstall (on the limited 12" release "There Goes The Ice"). His ear for a tune hasn't waned as has been proven with "Love From London", ten songs of social, political and personal commentary levelled at his beloved (and occasionally beleaguered) hometown, dressed up in a dandy suit of gentle pastoral pop with an occasional flash of bite. On his website he describes the songs as "paintings you can listen to and celebrates life in a culture imperiled by economic and environmental collapse". All of which makes for a top live show. His tour-dates for the autumn include stops in York, Liverpool, Manchester, Glasgow and a rare show in Witney! Tickets for all shows are on sale now, priced from £10 to £15 upwards.